Stuck in Wordbrain 2 Languages (Word Voyager 8×8). Here are the answers. 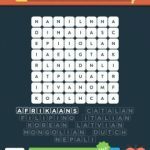 It starts Afrikaans, Catalan, F???? ?, Italian, Korean, ? Afrikaans, Catalan, Filipino, Italian, Korean, Latvian, Mongolian, Dutch, Nepali. Level 2 Arabic, Swedish, polish, Greek, Gaelic, Lithuanian, Russian, Romanian, Ukrainian.